By the end of last year, the company had around 250,000 solar panels and 126 wind turbines in operation across the world, according to its latest sustainability report. 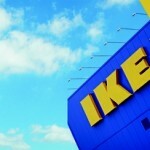 The company will invest a further £1.3m in renewable energy between now and 2015 as it tries to meet a target of having 100% of its energy use provided by renewable sources by 2020.IKEA says that while it will continue to invest in renewable energy sources, it will also expand and refurbish stores to improve energy efficiency. IKEA plans to increase same-store sales by 5% a year, while generating similar growth from new warehouses by doubling the rate of expansion after 2015. The retailer is expanding its product range for customers to live more sustainable lives themselves, focusing on waste handling and cutting energy and water use. It has also committed to converting all lighting IKEA sells to energy efficient LED. “Through products that use less energy and water and reduce waste, we are enabling millions of people to save time and money at home,” said IKEA’s chief sustainability officer, Steve Howard. “In our own operations, we’re continuing to invest in renewable energy and to source more materials from preferred sources”.